Have You Just Adopted a New Puppy or Dog from an Animal Shelter? If you’ve just adopted a dog or puppy from an animal shelter, good for you! When you adopt a dog from an animal shelter or rescue group, not only do you get to enjoy years of canine companionship, you also save a life. You should feel proud and good about your decision. As a new canine parent, you probably have a lot of hopes and dreams about life with your new furry friend. Those of us who have dogs wouldn’t trade the companionship and joy that a dog brings to our life for anything. After all, when you have a dog, you share your house with a furry creature who will be thrilled simply because you came home, fed him dinner, took him for a walk, played a silly game, or just gave him a really good scratch on the head. Having a dog is like having your own fan club. Plus, nothing can compare to looking into those big eyes gazing up at you with unconditional love. Of course, just like people, dogs are individuals. Not every dog behaves like the ones on TV. They aren’t robots; like people, dogs have good days and bad days. Plus, some dogs are shy and retiring, whereas some are big hairy goofballs. Most people get more training in how to use their cellular phone than they get learning how to be a good owner to an adopted dog or puppy. Many small animal shelters and rescue groups have neither the resources or personnel to offer much instruction. That’s why I wrote Happy Hound: Develop a Great Relationship with Your Adopted Dog or Puppy. 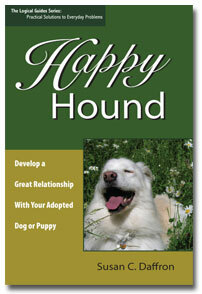 My name is Susan Daffron and am the author of Happy Hound. I wrote this book after years of volunteering at animal shelter and a spay/neuter clinic. There I saw many people where were completely mystified by their dog’s behavior. After all, if you’ve never owned a dog before, you may be wondering what your dog is thinking sometimes. It stands to reason: when you first bring home a dog, he doesn’t know the rules of your household. Your house may be very different from your dog’s last home. Have spent their entire lives outside, so they don’t know about housebreaking. Have spent weeks cowering in a cage in a noisy concrete kennel, wondering why their favorite human abandoned them. In many cases, you have no clue as to an adopted dog’s past. And the dog can’t tell you. Realistically, the dog doesn’t know you and you don’t know him. You haven’t established trust yet. A relationship takes time, but it really is possible for a obnoxious, rambunctious, jumping, wild thing or a shy, timid, phobic, weird, mutant dog to turn into into a well behaved companion that everyone enjoys being around. You just need a little guidance and information on how to communicate with your new dog and help him adjust. New dog owners struggle with some of the same issues new parents do. In much the same way it drives you nuts when Junior won’t clean his room, it can be frustrating to deal with a dog that never seems to listen and won’t do what you say. As with raising children, owning a dog requires patience and understanding. Plus, sometimes dog owners don’t realize exactly how attentive dogs are. Even though it may not seem like it a lot of times, your dog is paying attention to your actions and reactions. You may be inadvertently rewarding your dog for unwanted behavior. Happy Hound explains some of the things you may be “teaching” your dog without realizing it. For example, does this sound like you? “Sometimes I wonder if this dog is actually deaf!“ Some breeds of white and merle colored dogs are prone to deafness, so get your pet checked by a veterinarian first. If he’s not deaf, you need to consider the reasons he ignores you. If he truly is deaf, he can still be a wonderful pet, since deaf dogs can easily be taught hand signals. “Why do I have to yell all the time to get him to do what I say?“ You don’t. Yelling is stressful and doesn’t do much good for your relationship with your dog. Dogs hear far better than you do, so you don’t need to raise your voice. “What’s is the matter with this dog? He knows what I meant. He must be really stupid!“ If the dog is not reponding, he may not know what you want. Assuming you have communicated your wishes clearly using terms he understands, he probably isn’t sufficiently motivated to do what you are asking. You need to figure out what motivates your dog. It’s easy to learn how to communicate effectively with your dog once you understand how. Happy Hound also offers explanations for commonly used terms like “alpha” and “positive reinforcement.” You may think you are “alpha” but your dog may have other ideas. In Happy Hound, you’ll find out the things you can do to provide compassionate leadership for your dog. Some of the techniques may seem really simple or silly to you, but they speak volumes to your dog. Most dogs are motivated by only a few things. Understanding the dog’s view of the world is your first step toward developing a great relationship with your new adopted dog. Armed with only a few simple yet powerful techniques, you can change the dynamic from one of stress and yelling to peaceful coexistence, where you can communicate volumes with just a look, word, or a gesture. Three primary reasons dogs bark, along with two things to do and the one thing never to do when your dog just won’t shut up. Reasons why neutering or spaying your dog actually makes him or her a better family pet – and a lot healthier and happier, too! Six key items you should have on hand before you bring your dog home so you’ll both be comfortable. Six safety instructions you must teach your children not to do to avoid dog bites and the four things they should always do if they encounter a dog they don’t know. Three keys for surviving “canine adolescence.” As with human children, adolescence is a time when dogs test limits and try your patience! The two main reasons dogs generally jump on people and four ways to convince the dog you really don’t need that type of greeting. How to tell if your dog has fleas and the three areas you must treat to prevent reinfestation. What to expect when you bring your dog home after surgery and the key to preventing even incessant “lickers” from damaging their incision. As with people, no dog is “perfect,” but a well-adjusted happy dog is a pleasure to live with. I happily cohabitate with four dogs and it isn’t that complicated. Right now, my life with my four dogs is peaceful. I know that some of it is just them getting older (thank goodness) but I’ve learned a lot too. When I was volunteering at the animal shelter, I talked to them about what I was learning about my dogs and their problems. The manager encouraged me to start writing public service columns for the local newspaper, since I wasn’t the only one who was looking for information. At the shelter, we fielded the same questions over and over. People I didn’t know started complimenting about the “pet articles” in the newspaper, so I started putting them online as a permanent archive. Many people contacted me through the site asking questions, and rescue groups started asking me for permission to reprint the articles. Now many hundreds of articles and questions later, I’ve compiled all the information I learned into a book that is just for people adopting dogs. Happy Hound… gives the new owners of the rescue dog a very clear insight into the type of “baggage” nearly every rescue dog brings into a new home. This is different from the usual “how to” book that is written on teaching a new dog the desired behavior and manners in their new home. So many times a rescue group has no knowledge of a rescue dogs past so it’s difficult to understand some of their puzzling behaviors. Susan’s book will help solve some of these puzzles by helping you to understand the possible reasons for these behaviors. Happy Hound” is a good book for people living with rescue dogs or any dog, I might add. Using her own dogs as examples, Susan Daffron emphasizes that no two dogs are alike and that different training techniques will be necessary for different dogs. This is an important concept for people who have limited knowledge of breed characteristics and think that because their former dog behaved a certain way and was trained (or not) a certain way they expect a new dog to behave the same way. “Happy Hound” has helpful advise about feeding, grooming, medical problems, house manners, etc to give readers an idea of the level of commitment required to raise a dog. And last but not least, the author emphasizes that it takes time and patience to raise a dog you can live with. And, if you can’t make a long term commitment for the life of the dog, you should consider not adopting. I recommend it! You don’t get a dog expecting things to go badly. You want what we all want: a canine friend who will grow up with your kids, and be a loving part of your family. Most dogs are good natured and want to please. There’s nothing like having a dog look lovingly up at you with adoring liquid brown eyes. I spend most of my days with four dogs surrounding my desk. The peaceful sound of snoring and the occasional snuffle are part of my daily life. Periodically, a dog will wander over for a pet, and at 3:30 or so, there will be some agitation for a walk through the forest. I am not any type of “whisperer” but I did put some effort into teaching my dogs some manners and the rules of the house. You don’t have to be a great dog trainer to raise a wonderful family pet you can enjoy for years to come. (And Shouldn’t) Do for Your Dog? Many training methods focus on what you shouldn’t do (don’t say “no” to the dog in the case of positive reinforcement), but don’t tell you what you should do. That’s why in Happy Hound, I focus on strategies you can use to get your dog’s attention and figure out how to motivate him without yelling. How to get off on the right “paw” when you adopt your new dog. The first days after you bring home your dog can be critical to your future relationship. The most important command to teach your dog. Why repeating the same thing doesn’t help. If you are saying the same command over and over, learn what you actually are teaching your dog. How to teach your dog the most important “magic word” you need to know to enhance your communication. How to really communicate with a dog in ways he can understand. You’ll find that unlike breed-specific or veterinary books, Happy Hound has information that is specifically tailored to the special needs and issues related to living with a rescued puppy or dog. If you are curious what’s included in the book, check out a PDF file that contains the table of contents and the first chapter (701K). Note that because it’s a PDF file, you need the free Acrobat Reader to view it. I believe pretty much everyone who loves animals and shares their life with a canine wants the relationship they have with their dog to be a good one. Let’s face it, the “pet adoption option” isn’t always easy. But Happy Hound will show you how you can raise a dog who (like the old saying goes) really will be your “best friend” and shower you with companionship and unconditional love for years to come. Decide which is the right dog for you, along with a checklist you can use to help prioritize your likes and dislikes. Click this link to order the book from Amazon.com.